We carry a full line of bow accessories like Sights, Quivers, Rests, Targets, Broadheads, Arrows, Stablizers, Armguards, & Everything you will need to start shooting. We have the bow to fit your needs and budget. 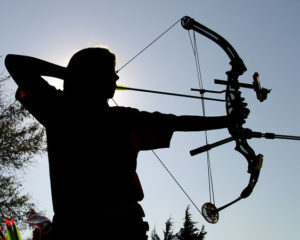 Our archery counter staff can assist you in finding what will work best for you. Our complete Maryland Master archery shop has all the tools and knowledge to keep your setup tuned and shooting like it should. Our Maryland Archery Technicians are able to Measure Maryland Archery Shop Arrows to Your Armlength with your bow & cut your arrows to the right length for you, right here at the shop. Where we also can tune your bow, change cams, adjust weight and draw length, and change strings & cables. Time to upgrade your bow? Our archery counter staff can help you pick the perfect bow for you and your hunting, target practice or bowfishing needs. We also have all the accessories you will need for your new setup. From all the top archery manufactuers like, Mathews, Bowtech, Hoyt, Ninja Bowstrings, AMS Bofishing, Barnett, Easton, Elite, Fuse, G5, Mission, NAP, Rage, Truglo & more archery product manufactuers. We Stock Archery Targets so you can keep shooting all year long and keep up with your practice shots, whether you want to stay on target for the next 3d shoot or take down that big buck this season. Come visit our indoor archery range! Our 20 yard range allows you to practice and make adjustments to your archery equipment, while our archery technicians stand by to assist!